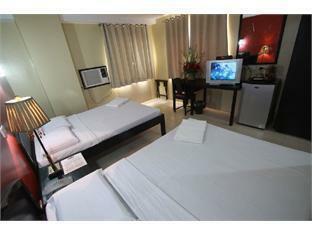 The Sampaguita Suites Plaza Garcia is located in Cebu making it one of the best hotels to stay at while in town. All hotel's guestrooms have all the conveniences expected in a hotel in its class to suit guests' utmost comforts. All of the guestrooms are replete with non smoking rooms, air conditioning, internet access, television, shower. Guests staying at this Cebu accommodation can enjoy a wide range of hotel facilities such as 24hr room service, elevator, coffee shop, room service, safety deposit boxes, hotel/airport transfer, Wi-Fi in public areas. For a more enjoyable stay, guests can take advantage of a variety of recreational facilities, including massage, spa. The Sampaguita Suites Plaza Garcia creates a balance of rich culture and modern convinience to ensure you a memorable stay. For your reservation at the Sampaguita Suites Plaza Garcia Cebu, please choose your period of stay and fill out our secure online reservation form.